After you click the LIBRARIES tab, you should see a number of libraries there (e.g. SASHELP, SASUSER, WORK). You should see the TEST data set listed there. 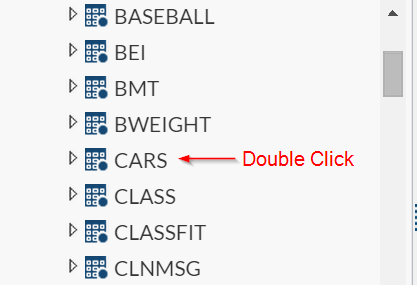 Expand to the SASHELP library and open the CARS data set. How many rows and columns are there in the data set? Click the "Get Solution" button below to view the answer.